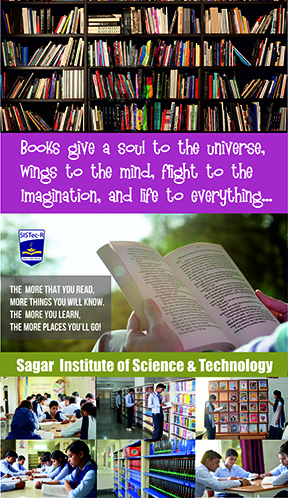 SISTec-R Library has a rich collection of books and journals in the field of Basic Sciences, Electrical, Electronics, Computer Science and Information Science, Mechanical, Civil Engineering Books and related areas. Library collection also includes documents for competition materials, Fictions, Stories, General books, Encyclopaedias and Dictionaries, Magazines, CD-DVDs, projects (minor and major) etc. It is spread over 400 sqft, and houses more than 30,000 books and other documents. The Library subscribes to more than 60 national and international journals. It provides widest possible access to information and this is reflected in the range of services provided by it. The Library spares no efforts to fulfil its mission by selecting, acquiring, organizing, reserving, maintaining, and providing access to a collection of materials and electronic resources that address the needs of the academic community. SISTec-R Library is fully automated with all possible modern facilities. At present, the Library offers services such as lending facility; Claims/Reservations; Renewals; Reading Room; Library Activities etc. The Library organizes various training programs/informative sessions for e-resources and also for print resources. The Digital Library section houses a good number of computers for browsing, accessing e-journals, e-books and for searching the Library database using OPAC. SISTec-R Library is automated with SOUL 2.0 is the software used for Circulation, Procurement, OPAC and Project Reports. All the library documents are bar-coded and books are issued to users by reading the barcode of the document. The Central Library has a separate Digital Library room with 10 computers for the use of staff and students to access the e-resources and other information sources subscribed by the Library. For Inter Library Loan i.e. for document Delivery Services, our library has made use of DELNET services. The DELNET link provides access to Union catalogue of the many engineering Libraries. It provides access to 487 journals and 2087 e-books full text available in the library. This union catalogue helps for sharing the resources, which is not available in our library. The users can request articles and books which are not available with us. DELNET charges nominal fees for photocopy and postal services. The Central Library is also a member of NDL which gives access to e-books. The database has 63, 00,000 Books starting from primary to PG Level. There are more than 1, 50,000 Engineering e-books. Evening Library, Separate reading section; reference Section, Open Access System Online Full-Text Journals Bibliographic Database e-Resources, Subscription Through DELNET.